Welcome to The Oak Community Church. Whether you are already part of the church, looking for a church or live in the community and want to find out more about us, this site is for you. If you're thinking of visiting for the first time. Check out our page devoted to those visiting on Sunday. Church starts at 10:30am. We're a lively church based in the centre of St Pauls Cray, Kent. Our aim is to reach out to the local community showing both the love of God and its practical outworking in real lives. 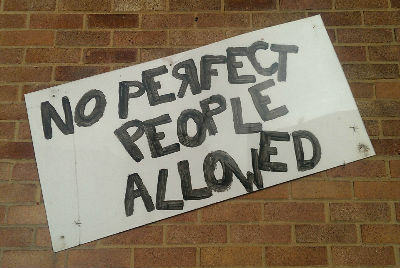 Some people call us the "No Perfect People" church due to our sign outside. It's a reflection of our intention to give a warm welcome to all people. Whatever your background, beliefs, personality or lifestyle - you're not perfect. Neither are we. That's why you're welcome. "Come as you are" with all your imperfections and join us as we meet a perfect saviour who's helping all of us to be more like him. On this site you will find information about all our activities, some of our upcoming events and a flavour of the people who meet together at The Oak. Use the menu provided to find everything you need. If you can't find what you're looking for then why not just contact us.